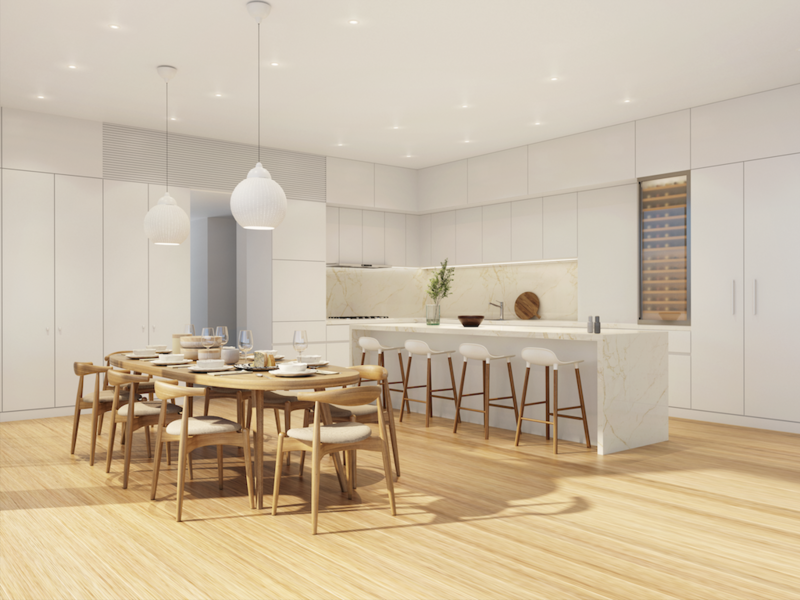 The first interior renderings and details of Terrace House, the highly anticipated development by Pritzker Prize-winning architect Shigeru Ban and the world’s tallest hybrid timber structure, have been released. Exterior rendering. Image via Port Living. 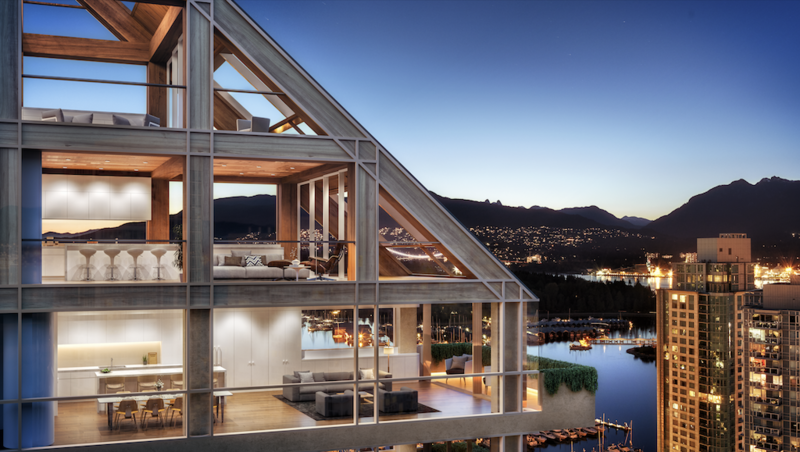 Each home is designed to enjoy not only an unparalleled living experience, but also serves a visual feast offering a banquet of views of the city skyline, mountains and inlet. Signature terraces flank the building, providing outdoor spaces off the living rooms, bedrooms and bathrooms in most residences. These terraces are finished with ambient cove lighting and porcelain tiles selected to match the interior white oak wood flooring and to seamlessly integrate indoor and outdoor living through floor-to-ceiling sliding glass door systems. Landscaping, designed by world-renowned and decorated landscape architect, Cornelia Oberlander, will complete each terrace and the buildings common spaces. 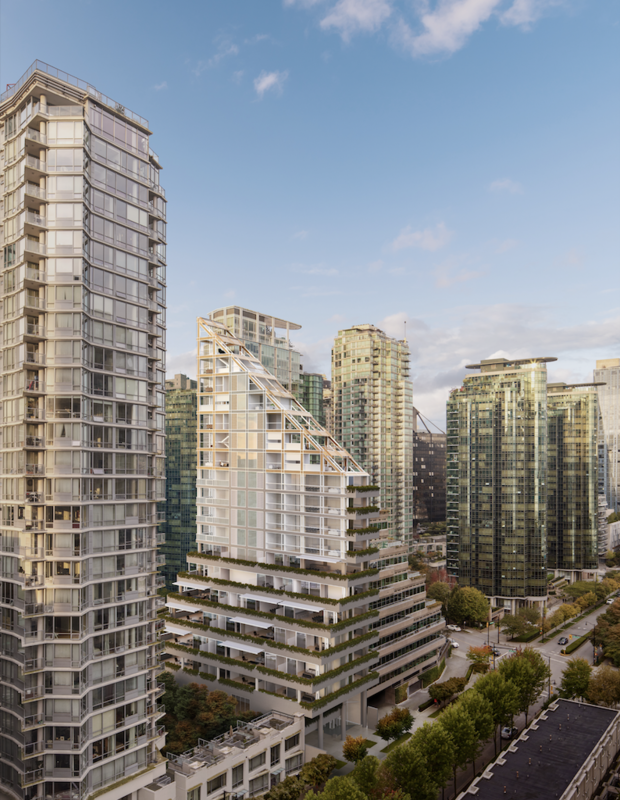 Every element of each home has been selected by Shigeru Ban and PortLiving and meticulously chosen to support Vancouver’s most significant tower. The kitchens feature polished chrome and stainless-steel fittings, custom cabinetry, and white marble countertops. 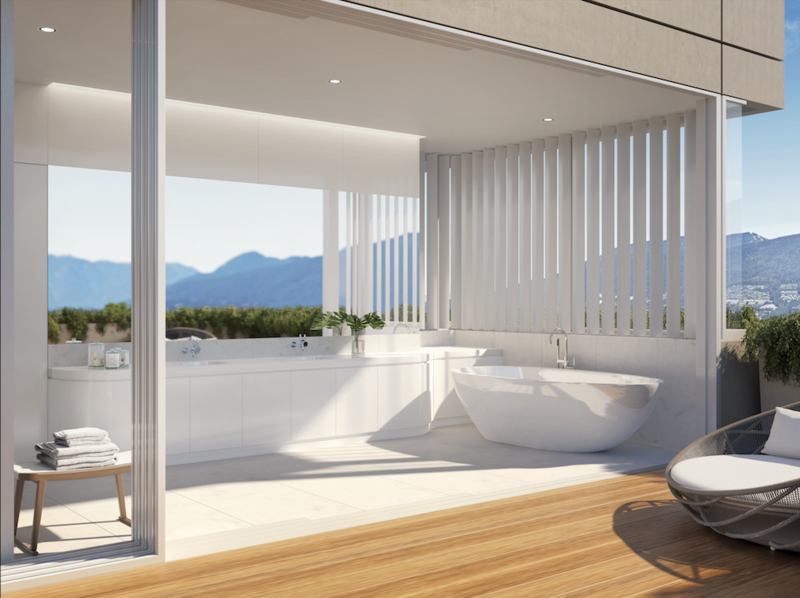 The bathrooms marry solidarity with transparency; floating white Corian countertops, expansive windows and floor-to-ceiling, sliding glass doors on modern track systems, and Thassos marble floors. 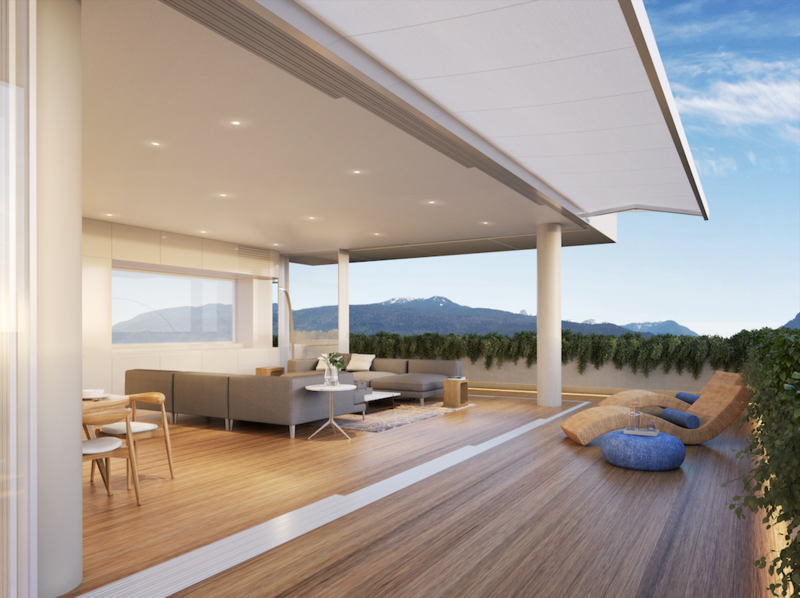 All living spaces have generous ceiling heights ranging up to 27 feet, panoramic windows, and breathtaking views. The bedrooms are complete with custom Shigeru Ban-designed millwork, walk-in closets, and spa-inspired en-suite bathrooms. The homes within the upper timber levels feature vertical and horizontal wood structural beams and columns set against a minimalistic palette. 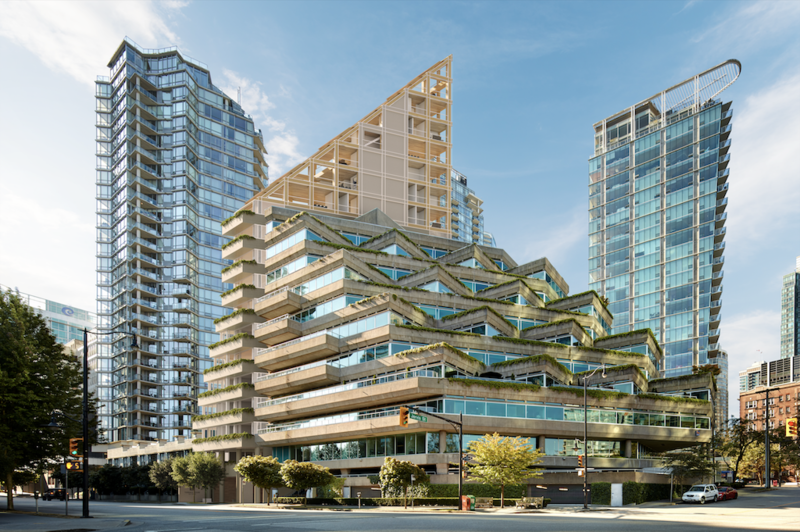 Douglas Fir timber is used to construct these residences, harvested from sustainably managed forests in the Kootenay region of British Columbia, approximately 700 kilometers from the project site. The Douglas Fir ceilings in these homes have been designed with acoustic channels to absorb sounds and add warmth to the living areas. The homes are encased in low-emissivity glass and feature Winter Gardens, large enclosed terraces equipped with electronic, motorized glass-sliding panels, a pioneering design not to be found anywhere else in the world. Limited to 20 homes, each residence is as distinctive as it is spacious. Almost half of the homes at Terrace House occupy entire floor plates, some over multiple levels, with a vertical orientation allowing for only 3 homes to occupy the top 7 floors of the building.